Washing my hair is part of my daily routine, and with the colder weather drawing near, I have to be extra cautious. 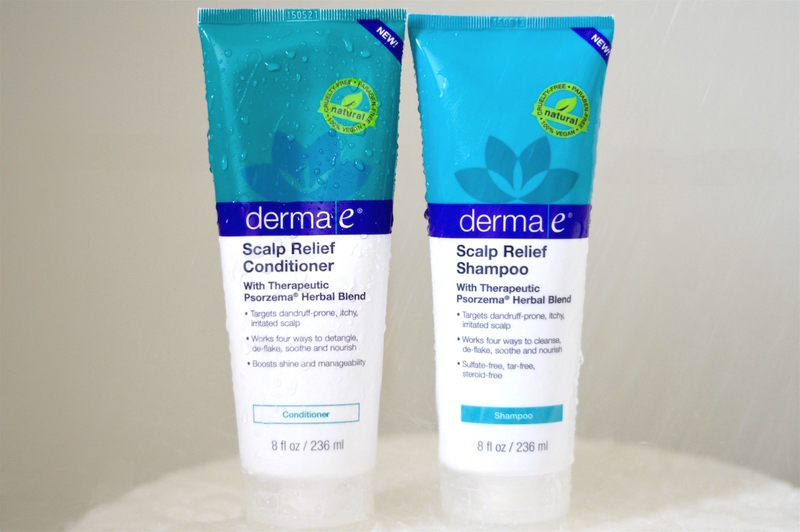 A dry, itchy scalp could make an appearance at any time, so when I received a sample of Derma e®'s new Scalp Relief line, I began testing it right away. This shampoo and conditioner is part of their "Therapeutic Tropicals" range. It's main aim is to help your body repair itself when dry and itchy dandruff appears. Though my scalp is in good condition right now, I always notice minor flakes and irritation from time to time. After using the shampoo and conditioner daily for over a month, I have definitely noticed an improvement in the condition of my scalp and hair, from root to tip. The formula works in four ways to gently cleanse, detangle. 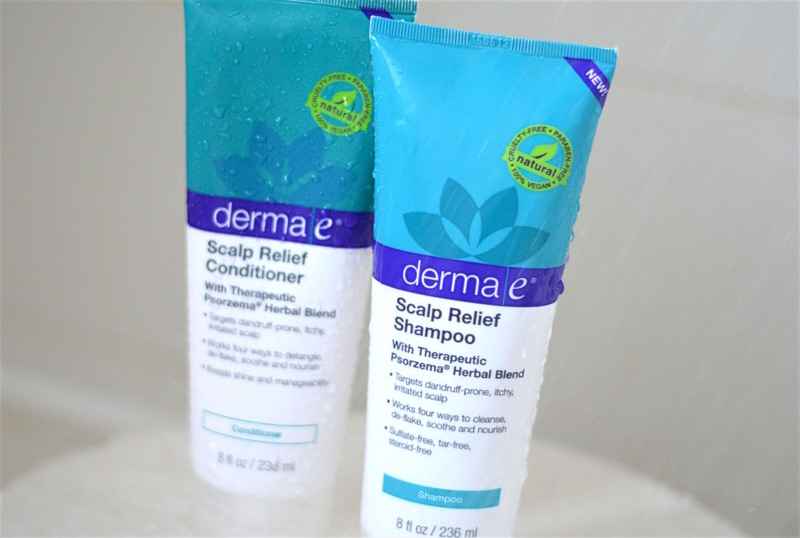 de-flake, soothe and nourish a dandruff-prone scalp. The conditioner calms the scalp while locking in moisture to replenish hair. This line is safe for colour treated hair. The shampoo is a clear gel, and the conditioner is a thick white cream. I love the shampoo since it's pretty basic - no drying ingredients like Sodium Lauryl Sulfate, but an effective cleanser overall. The fragrance is light and refreshing, perfect for women or men. Apply to freshly shampooed hair and SCALP. omg. conditioner on my roots. will I survive? Sure enough, I'm still here to tell the tale. And my hair is not an oil slick! I massaged a generous dollop of conditioner all over my hair and scalp, and left it to penetrate for 2 minutes. Then rinse, dry and style as usual. I am so pleased and frankly overwhelmed, since my thin hair is consistently light and manageable after using the conditioner. Best of all, it feels amaaaaaazing. So soft, so silky, so healthy. The routine doesn't force me to wash my hair any more or less, but it is sure to provide a tangle-free, silky smooth finish to my hair. A-pproved. Derma e® has an "evaluation" quiz online if you'd like to get some tips on what products work best for your skin type. Click here to check it out! To find a Derma e® retailer nearest you, feel free to use their store locator linked here. All Derma e® products are 100% vegan, gluten-free, GMO-free, paraben-free, cruelty-free, packaged for recyclability and proudly made in a wind-powered facility in Southern California, USA.